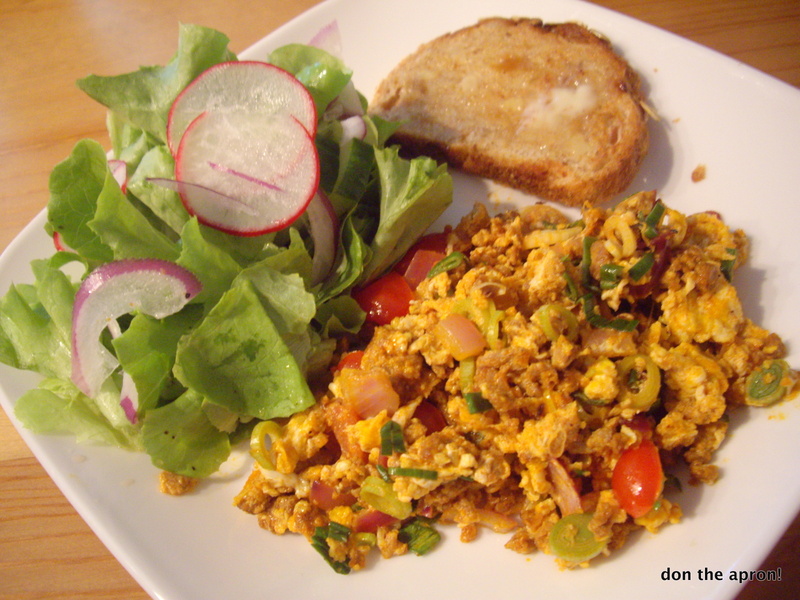 Soy Chorizo Scramble | Don the Apron! A story I remember fondly from my childhood involved some Chinese monks who wanted to reduce the aggression of their king so he would be a more equitable ruler. They developed a mock meat that tasted so good the king never knew the difference, and after a year, he became more placable through reduced meat consumption. Whether this story is true or not, it gave me quite the soft spot for traditional Chinese meat analogues such as the “mock duck” or “gluten chicken” that occasionally made an appearance on our home menu. Soy chorizo is one of the few “fake” meats I think actually tastes like the food it is attempting to replicate (the other being Morningstar Farm’s super-processed veggie corn dogs, my guilty pleasure). I am partial to Trader Joe’s brand, which I think is a good example of the genre and easy for me to purchase. Note that this is a Mexican-style chorizo, which, although encased like a sausage (in plastic! don’t cook the casing! ), is made to crumble apart when cooked. This is different from Spanish-style chorizo which, like a bratwurst or sausage, can be sliced or cooked in link form (if not already cooked). The flavorful dish is bold yet comforting, and perfect for a hearty breakfast or a quick weeknight dinner. The spices in the chorizo are warmed by an additional pinch of cumin, not dominating but instead just enriching the overall flavor profile. I served it with a simple salad (oak leaf lettuce + radishes + red onion + cucumbers + red wine vinegar + extra virgin olive oil + salt + pepper) and a slice of buttered toast, for a simple but filling dinner with a good friend. In a large skillet on medium-high heat, sauté chorizo and onion until onion softens. Most chorizo is relatively oily, so you likely won’t need to add additional oil to the pan. Crack eggs into the chorizo/onion mixture, breaking up the egg as it sets. 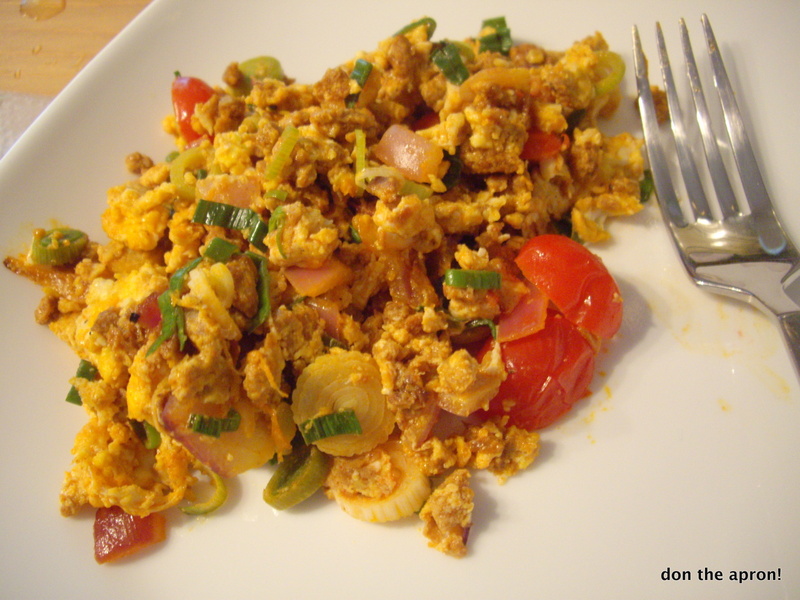 Once egg is partially set, add diced tomato, cumin, salt and pepper, and mix thoroughly. Allow tomatoes to continue to cook. A minute before egg sets, fold in chopped green garlic. Remove from heat for a minute, plate, and serve with sliced avocado. This entry was posted in CSA, Don the Apron Original, Main, Produce, Recipe, Vegetarian by Lin. Bookmark the permalink. Pingback: Chorizo Potato Tacos | Don the Apron!